The Microscopy and Histology Core Facilities at La Jolla Institute were developed to help local scientists with their imaging needs in a static or dynamic (in vitro/in vivo) scenario by offering histology and microscopy services and providing support and training to interested researchers. Dedicated personnel can assist in all essential steps of an imaging experiment starting from experimental design, sample preparation through image acquisition and data analysis. The facility offers a range of light microscopes, related imaging systems and image analysis resources for assisted or independent use (upon training). The facility operates on a fee for use basis and is open to all potential users. 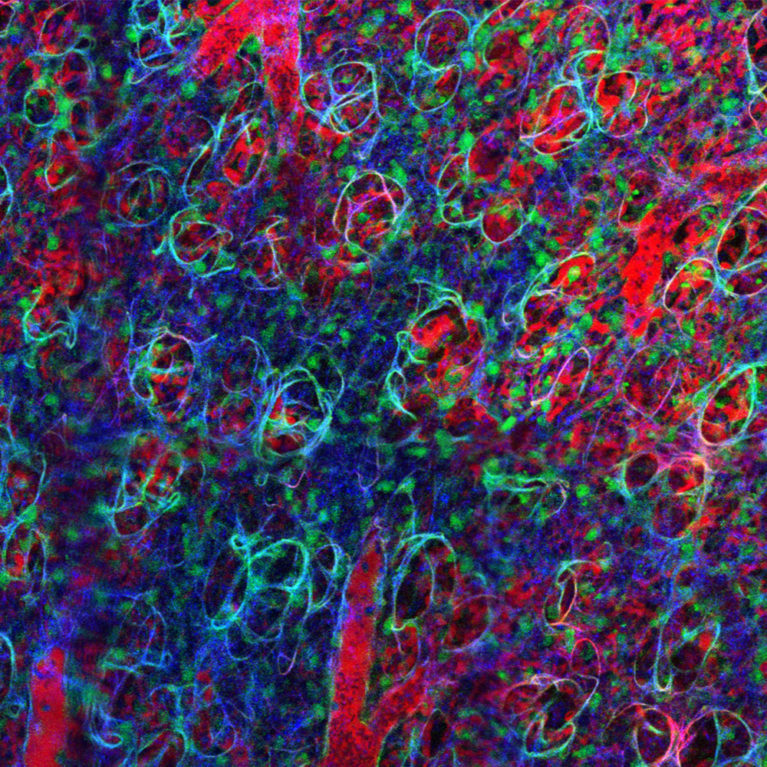 From whole animal imaging to resolving details beyond the diffraction limit, LJI microscopy facility offers one stop shop for all your light microscopy needs. In addition to microscopy services, our staff offers full service histology. Dedicated personnel will take care of your samples to deliver high quality sections which can be digitized and analyzed with the help of our in-house experts. We offer advice on proper sample fixation, processing, embedding of tissues with attention to desired orientation, decalcification of bone tissue, cutting of paraffin blocks, cryosectioning, routine, special and immunostains as well as training in histological techniques. Tandem (conventional and resonant) galvanometer scanhead. 25x/1.00 W motCORR HC IRAPO L, Working Distance 2.6 mm. Water immersion objective with high transmission and color correction optimized for excitation in IR up to 1300 nm. Motorized correction collar for precise and fast adjustment of the optics to changes in refractive index. Use with or without cover glass. 20x/0.75 W HC PL IRAPO, WD 0.67 mm. Water immersion objective with high transmission and color correction optimized for excitation in IR up to 1300 nm. Use with or without cover glass. 40x/1.1 W CORR HC PL IRAPO, WD 0.65 mm. Water immersion objective with correction collar optimized for multiphoton applications. Use with 0.14-0.18 mm cover glass. 63x/0.90 W U-V-I CS2 HC APO L, WD 2.2 mm. Water immersion objective with high color correction and high transmission. Use without cover glass. 63x/1.40 OIL CS2 HC PL APO, WD 0.14 mm. Oil immersion objective with superior color correction; optimized for confocal scanning applications. 20x/0.95 Water IR corrected XLUMPLFL20XW, WD 2.0 mm (Olympus). For special multiphoton applications. 25x/0.95 Water HCX IRAPO L, WD 2.4 mm, Cover glass 0.17 mm. For special multiphoton applications. 10x/0.40 Air HC PL APO CS, WD 2.2 mm, Cover glass 0.17 mm. Air objective good for taking an overview of the sample. Not optimized for 405 nm excitation. The Zeiss LSM 880 was acquired through the Shared Instrumentation Grant Program (S10) and must be cited for its use: NIH S10OD021831. Airyscan FAST GaAsP detector for enhanced sensitivity and resolution. 2 bi-alkali PMTs and a 32-channel spectral GaAsP detector. 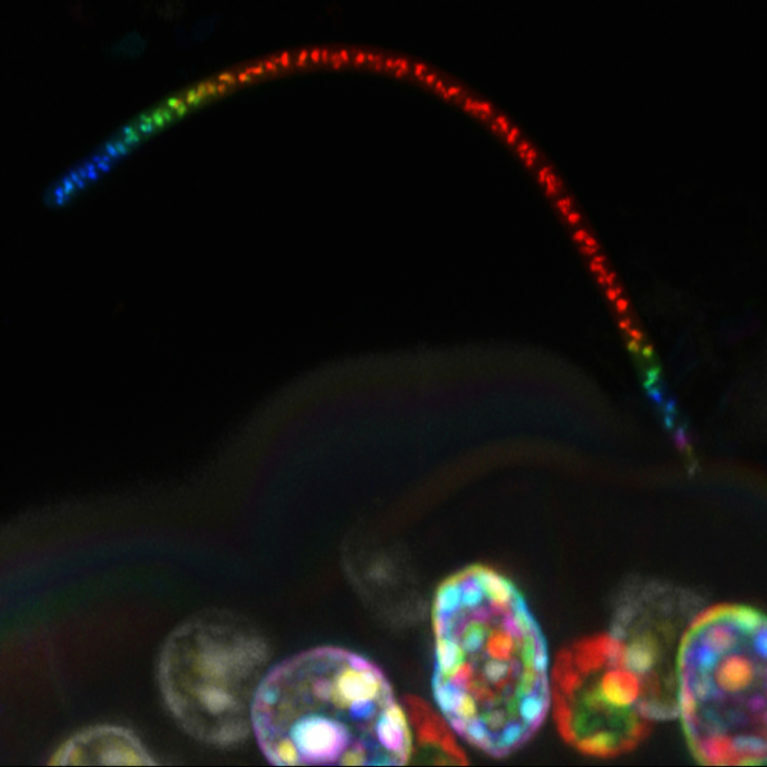 - Automated brightfield and fluorescence imaging of whole slides. - Barcode scanner and automated tissue detection. - Enhanced depth of field for uneven samples. High-efficiency filter set suitable for fluorescent dyes like Hoechst, AF488/GFP, AF568 and AF647 which use 385, 475, 555 and 630 nm excitation. Contains dichroic mirrors 405 + 493 + 575 + 653 and emission filters 425/30 + 514/30 + 592/30 + 709/100. High-efficiency filter set suitable for fluorescent dyes like CFP, YFP and mCherry which use 430, 511 and 590 nm excitation. Contains dichroic mirrors 450 + 538 + 610 and emission filter TBP 467/24 + 555/25 + 687/145. Spectral, Excitation filters: 400-414 nm, 484-504 nm, 566-586 nm, transmission bands: 446-468 nm, 520-540 nm, 614-642 nm, emission filters: 446-468 nm, 520-540 nm, 614-642 nm. Each workstation is equipped with two 32” Dell U3014 color calibrated monitors and connected to LJI servers for secure data storage. Segmented filamentous bacteria growing on the host epithelium. 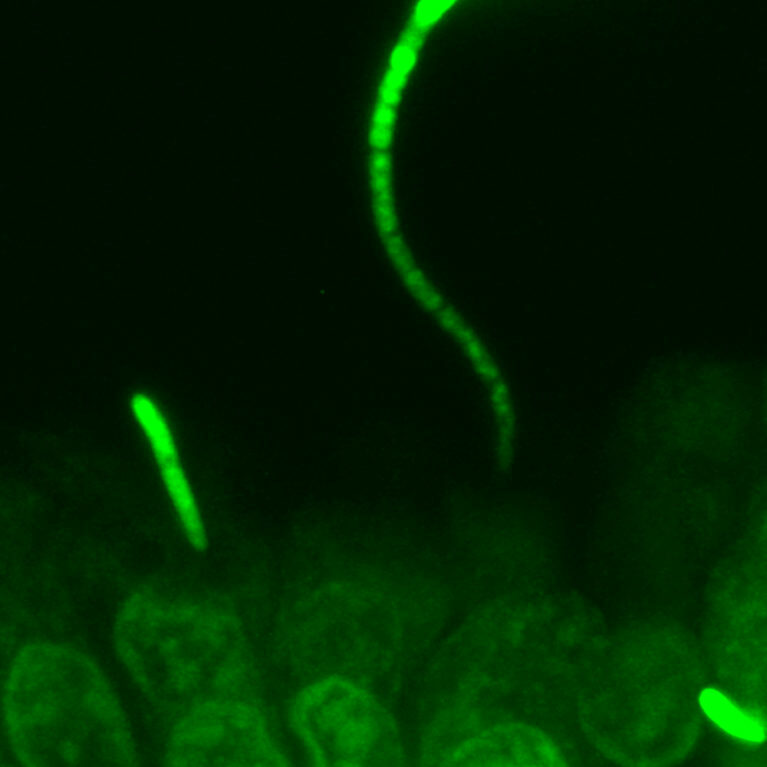 Whole mount sample of mouse gut was stained with nuclear dye YoYo-1. Image: Courtesy of Gooyoung. Instrument: Zeiss LSM880 with Airyscan. 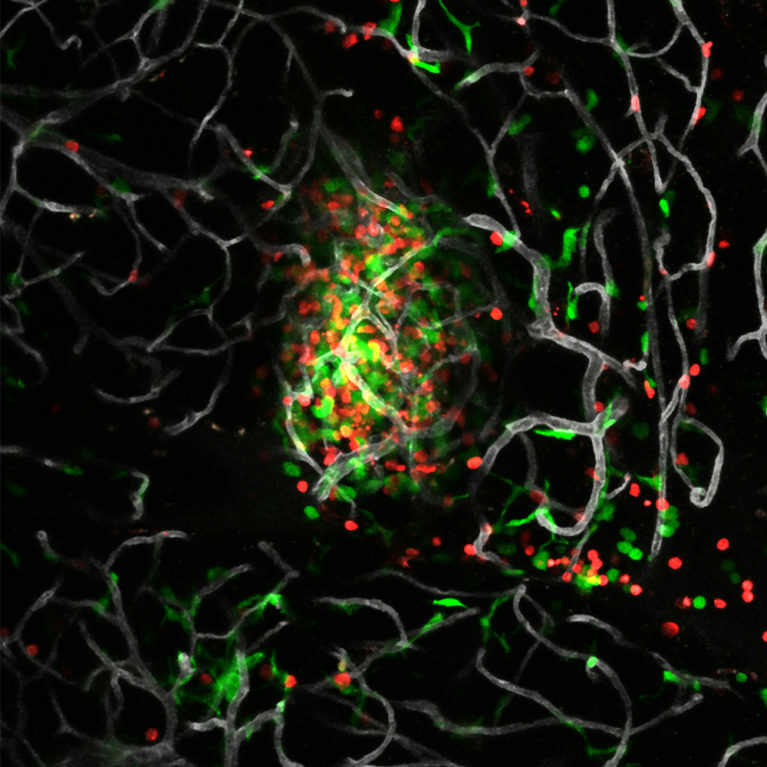 Monocytes in irradiated mouse leg vasculature. Image courtesy of Paola Marcovecchio. Tile scan image was captured on Leica SP5. Tile scan of lung architecture in an actin-CFP mouse as imaged by intravital microscopy. Mouse was injected with Evans blue prior to imaging. 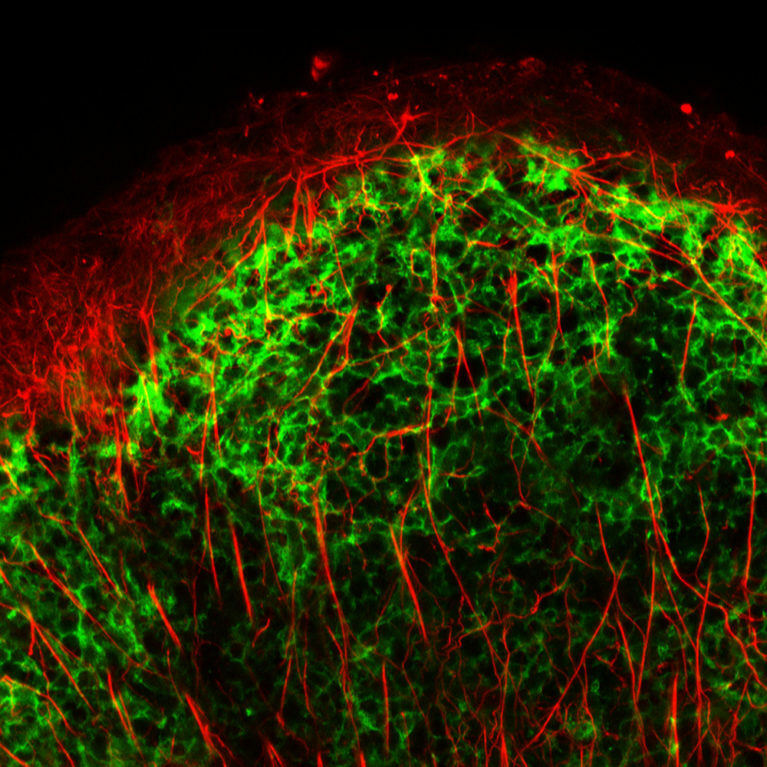 Dark blue: confocal reflection; green: actin: red: vasculature. Image: Courtesy of Catie Crosby. Instrument: Leica SP5 confocal microscope. 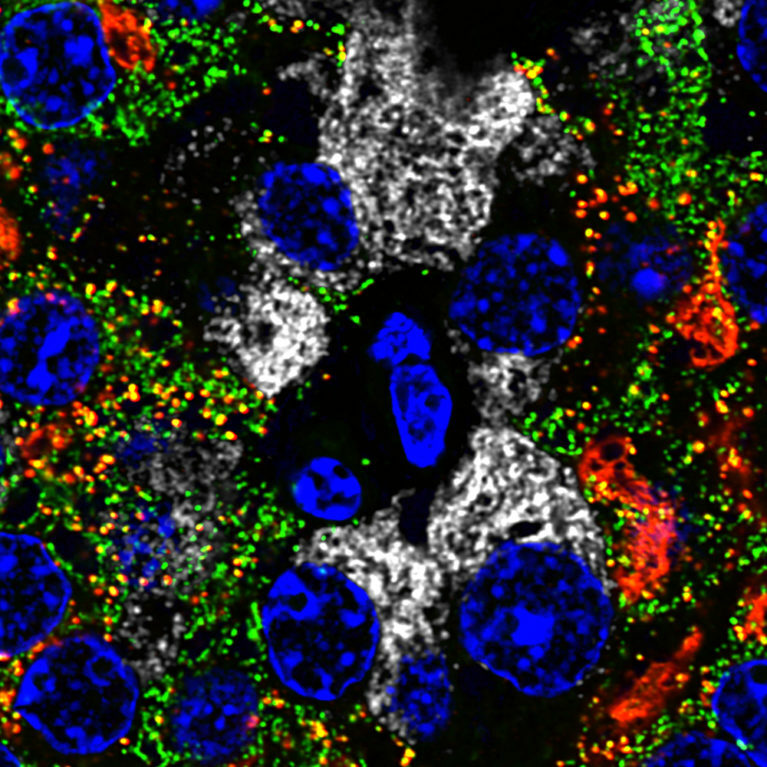 Pancreatic island cells labeled with antibodies to insulin (green), proinsulin (insulin precursor, red), glucagon (gray) and nuclear staining (blue). Image: Teresa and Zbigniew Mikulski. The image was acquired on a Zeiss LSM 880 microscope with Airyscan technology. Inflamed intestine. 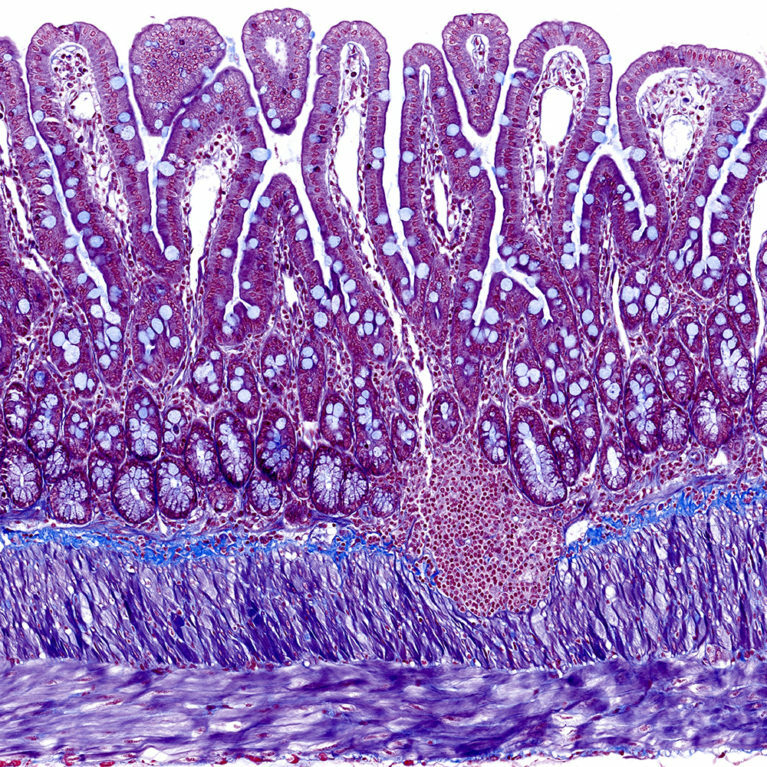 Collagen fibers between the mucosa (red/pink) and muscles (purple) are stained blue. 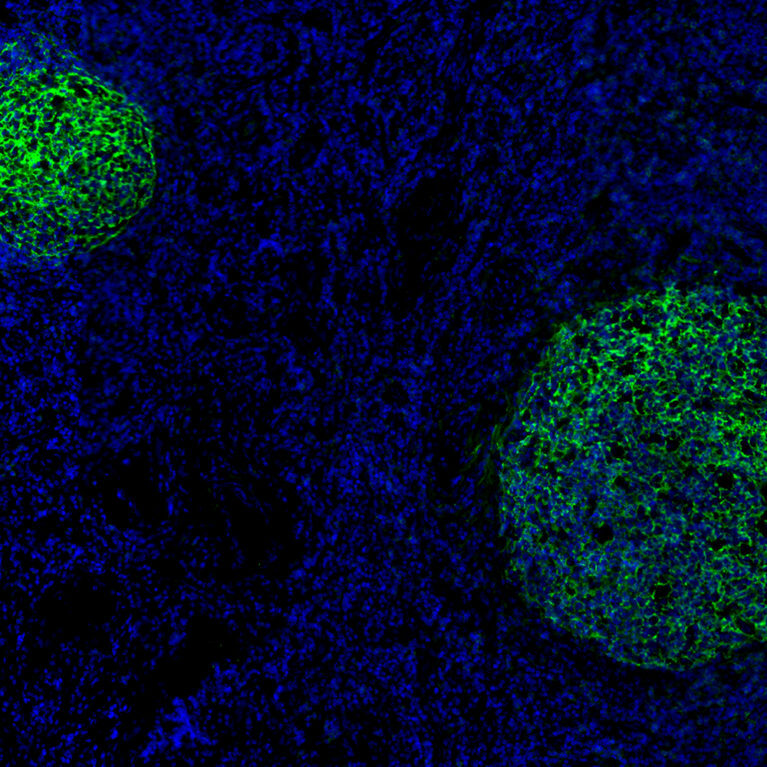 Infiltrating immune cells can be seen in the middle of the picture. Sections prepared and stained with Trichrome by Margie Chadwell. The image was acquired by Zbigniew Mikulski on a Zeiss AxioScan Z1 slide scanner. Endothelial cells in kidney glomerulus stained with anti-CD31 antibody. Color-coded depth projection. Image: Courtesy of Konrad Buscher. Instrument: Zeiss LSM 880 with Airyscan. The image shows follicular dendritic cells stained with anti-CD21 antibody (green) in germinal centers of a human tonsil section. Sections prepared by Margie Chadwell, stained by Zbigniew Mikulski. The image was acquired on a Zeiss Axioscan Z1 slide scanner. The hornets' nest of type 1 diabetes. An inflamed islet of Langerhans is infiltrated with macrophages (green, CX3CR1-GFP) and CD8+ T cells (red, P14-DsRed) in the pancreas of a RIP-GPxCX3CR1+/GFP mouse. 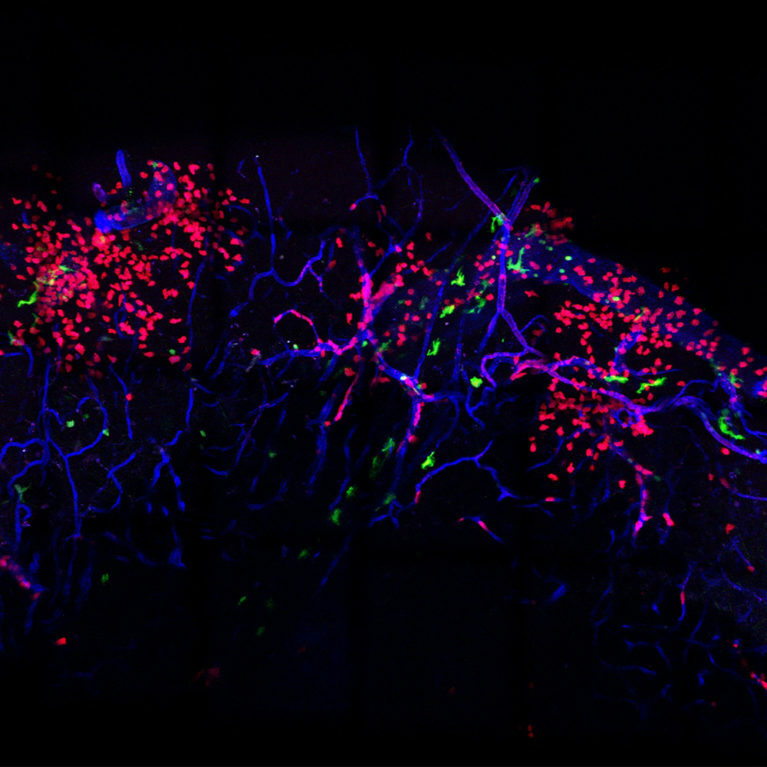 The vasculature (white) was visualized by an intravenous injection of anti-CD31-mAb conjugated to Alexa Fluor 647. Image: Courtesy of Gustaf Christoffersson. 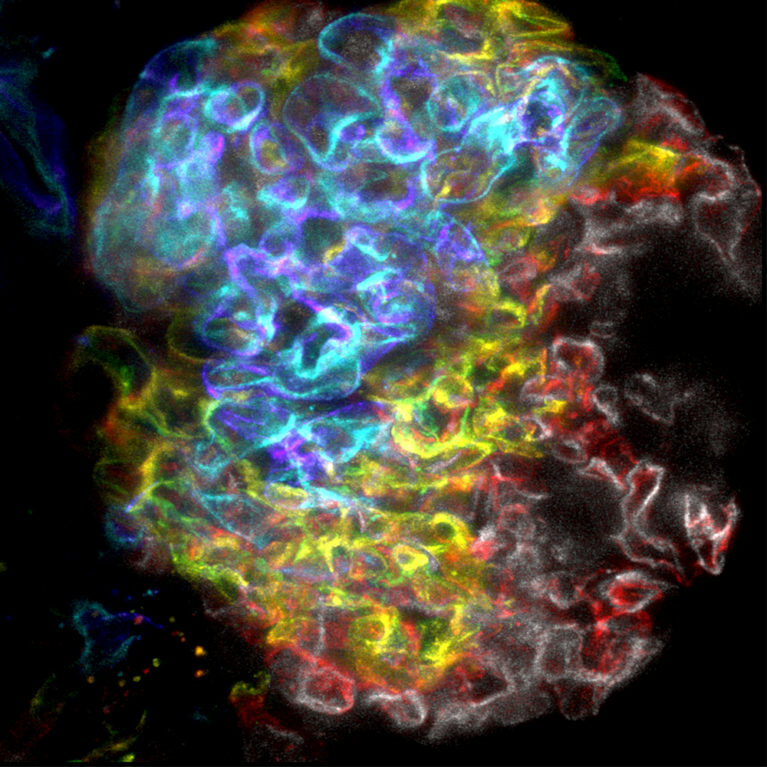 The image was acquired on a Leica SP5 confocal microscope. For all scheduling requests, please contact Zbigniew Mikulski below.